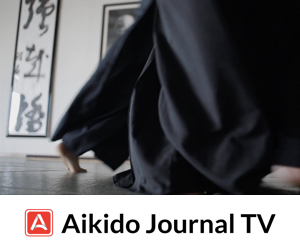 This story about Koichi Tohei is featured in one of the modules from Aikido Journal’s new Ki Aikido course, which releases this Friday, April 6th. This entertaining and insightful anecdote was recounted to Stanley Pranin by Shoji Nishio. Mr. Tohei went to Hawaii in 1953. On his return, he brought back a leather coat which was impossible to obtain at that time in Japan. It had fringes like the ones you see in western movies. He had a leather coat when it was impossible even to obtain leather shoes! I really thought it was amazing. Then, that coat was skillfully stolen. That was what had happened when I turned up for training. I saw that all of the uchideshi had been made to sit in seiza and Mr. Tohei was shouting something. Then I heard that Tohei Sensei’s coat had been stolen. 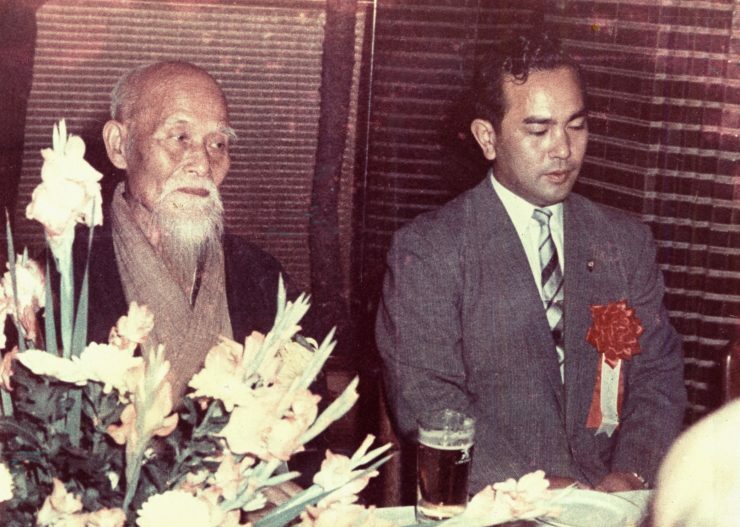 At that time Mr. Noguchi, Mr. Genta Okumura and Mr. Sunadomari were some of the uchideshi. 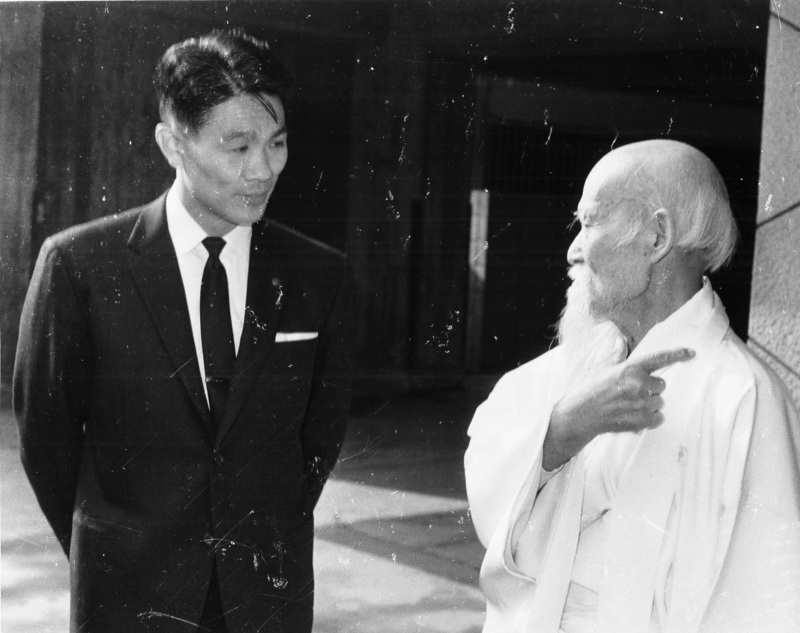 Then O-Sensei appeared asking, “What’s up?” When Mr. Sunadomari explained what had happened O-Sensei responded: “Oh, it was stolen, was it?” (Laughter) Then he came into the dojo. Tohei Sensei also sat in seiza because O-Sensei entered. O-Sensei started to walk around them. We were really wondering what he was going to say. What he said was: ‘You’re the one to blame, Tohei.’ Then, he disappeared. Tohei sat silently for a while. Then he, too, disappeared. Everybody was relieved and started training. 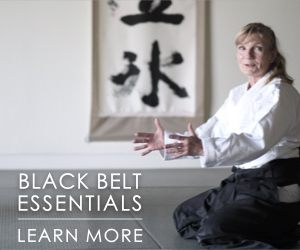 Our new Ki Aikido course launches Friday April 6th. I have to take issue with that narrative. It’s like saying your house was burglarized because a thief wanted your stuff and it’s your fault for having nice stuff for a thief to steal! I’m calling BS on this! 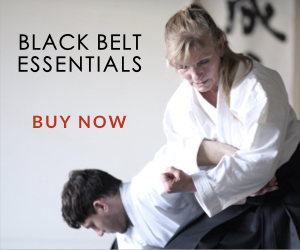 Great story, I recall Sensei Stan Prannin telling us the same story in his garage dojo in Monterey in the early 70’s. Stan really appreciated Sensei Nishio’s teachings and also stressed the importance of atemi in all his techniques. He was also very observant when showing us his collection of O’Sensei’s 8mm movies, he would point out every instance where the founder would use attemi. 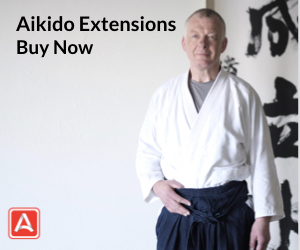 He said that Nishio Sensei felt that 90% of Aikido techniques had some form of mind taking attemi, the idea he stressed was to separate the opponents mind from his body thus insuring a successful technique without harm to the attacker. That story reminds me of the time when the tuition box at the Yôseikan Honbu Dôjô in Shizuoka was stolen. It was near the Dôjô main entrance and easy to reach for students to pull their assigned envelope and insert their Gessha (monthly tuition fee). It was also easy for someone to sneak in, open the box, cross the mat area and leave through the back door. 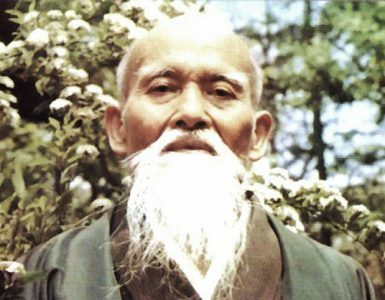 Mochizuki Sensei felt responsible: he was deeply concerned, not about the loss of money, but by the fact that he had missed to acknowledge the deterioration of ethics in Japanese society. It was suggested to move the tuition box next to Sensei’s room on the second floor. Sensei felt that it would penalize the honest students and decided to bring the tuition box on the top of the stairs. It was impossible to go upstairs without making noise. Who would take that risk? This wisdom is a result of the universal principle of things having a natural tendency to return to the norm. In the case of the leather coat, the thief is the means of returning someone with a leather coat to the norm, with no leather coat. Hence, to avoid creating a thief no one should deviate from the norm. But in this case the norm can never change, as the only way the norm can change is by deviations from the norm. Thieves are therefore a consequence of society advancing.